10-year yields have moved up to levels not seen in more than a year. Don't worry about rising rates, say legendary bond investors Jeffrey Gundlach and Dan Fuss. 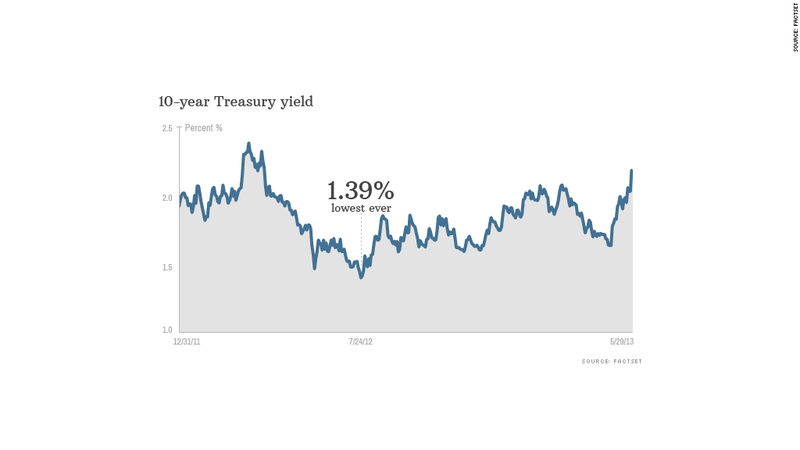 After hovering at or below 2% since last summer, yields on Treasuries spiked this week. The 10-year yield hit 2.23% Wednesday, marking its highest level in more than a year and well above the all-time low of 1.39% reached last July. But Doubleline Capital's Gundlach and Loomis Sayles' Fuss say the recent rally in yields is unlikely to continue, thanks to the Fed. Both say the Federal Reserve will make sure that any rise in rates will be slow and controlled. Gundlach and Fuss said that the consequences for global markets and the economy will be dire if the central bank fails. "People have been saying that the Fed thinks the economy is self sustaining, and that means lack of support for bonds," said Gundlach. "But the whole structure of the financial markets has been balanced on top of low interest rates." The Fed has been buying $85 billion a month of mortgage backed securities and other assets to stimulate the economy and push rates down, and Fed chairman Ben Bernanke recently warned of risks if the central bank scaled back its bond buying program too soon. Still, Bernanke also said the Fed is watching economic numbers to decide how long it will continue its stimulus. Those comments spooked some bond investors since economic numbers have been recently showing strength. Housing has been a big driver of the recovery, and any increase in interest rates could derail that, Gundlach said. If rates rise too quickly, mortgage rates will also move higher, which could cut into homebuying and refinancing. For Gundlach, whose firm manages roughly $60 billion of assets, assumptions of longer-term Fed intervention makes him a buyer of Treasuries with a duration of more than 10 years. He calls Treasuries "reasonably attractive" even as he admits that "it's hard to love something that pays 2.1% for 10 years." But Gundlach says Treasuries still offer good value compared with other asset classes. Fuss, who oversees Loomis Sayles' bond fund with roughly $66 billion under management, isn't keen on buying bonds now, even as he brushes off fears of sharply rising rates. "My instinct is that rates are going to go higher, but on a well-controlled basis." They may not agree on whether to buy or not to buy, but the legendary bond gurus were pretty close on where they see yields headed this year. Gundlach expects the absolute highest for the 10-year yield this year is 2.4%, but he expects it to stay closer to 2%. Fuss expects rates to rise slowly, but with a lot of volatility. He thinks the 10-year yield will end the year between 2.4% and 2.6%. Neither expects rates to drop back to their July 2012 low. That, says Gundlach, was "the low."